In 2014, Oxford University Press published a book written by Marco Fontani, Mariagrazia Costa and Mary Virginia Orna, and edited by Jeremy Lewis, called The Lost Elements: The Periodic Table’s Shadow Side. Fontani and Costa are chemists at the University of Florence, Italy. Orna is a professor of chemistry at the College of New Rochelle, New York. The 530-page book is an eloquent, interesting description of supposed discoveries of new elements that turned out to be illusory. The dust jacket reads, "Throughout its formation, the periodic table of elements has seen false entries, good-faith errors, retractions and dead ends. 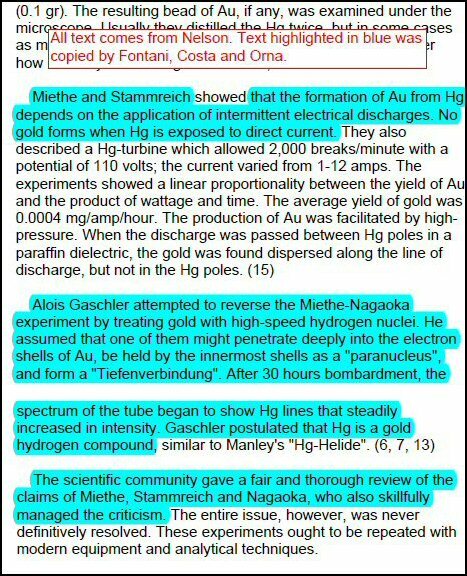 In fact, there have been more falsely proclaimed elemental discoveries throughout history than there are elements on the table as we know it today." The book contains a 33-page section called "Modern Alchemy: The Dream to Transmute the Elements Has Always Been With Us." 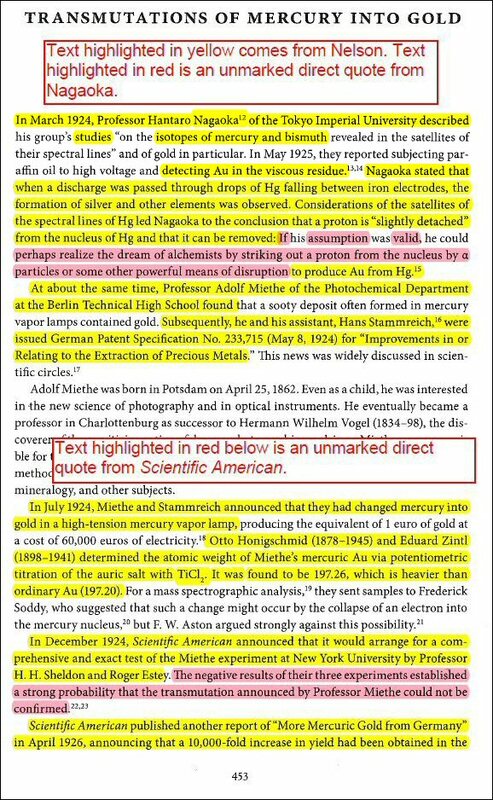 This section is primarily about elemental transmutation research that took place in the 1910s and 1920s. The authors also briefly discuss modern science experiments in the field of low-energy nuclear reaction (LENR) research. When I learned about the Lost Elements book, I had just completed the manuscript for my book Lost History: Explorations in Nuclear Research, Vol. 3. Lost History describes the elemental transmutation research that took place in the 1910s and 1920s. By 1930, the research from the previous two decades had largely been dismissed as errors and mistakes. However, very few confirmed errors or mistakes were ever identified. The reason the research was dismissed was that the results were not theoretically understood and the experiments were difficult to repeat. Consequently, the research was omitted from subsequent scientific reference material. News of this forgotten body of research didn't resurface until the 1980s, when a researcher and author named Robert Nelson spent many days poring through Chemical Abstracts at the University of California, Berkeley. Nelson suspected that the research had merit, and a chapter in my book discusses Nelson and his quest. In the mid-1980s, Nelson began publishing his research findings, first in a photocopied version and later on his Web site in a collection called Adept Alchemy. Nelson appears to be the only person who has found and documented this body of lost research — at least in the English language — since the 1930s. In 2012, I began writing my book Hacking the Atom: Explorations in Nuclear Research, Vol. 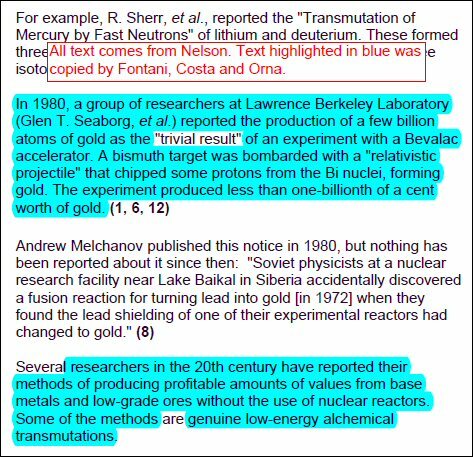 1, describing nuclear transmutation work performed during 1990-2015. At that time, I was aware of only a fraction of the 1910s and 1920s research. As I began checking that research, I found Nelson's research and discovered, through his work, that a substantial additional body of important scientific history existed. I decided that it was of sufficient scope and importance to merit its own book, and this led to my critical analysis of that research and my book Lost History. Although I have done my own research and investigation for Lost History, Nelson provided the road map for me as well as many of the bibliographical references that led me to the original scientific papers. In August 2015, one of my editors was checking facts and brought Fontani's book, Lost Elements, to my attention. I was surprised to learn that Lost Elements broadly (but superficially) discussed most of the transmutation experiments that took place in the 1910s and 1920s. I assumed that Fontani, Costa and Orna had performed their own research, analysis, and writing. The book is well-written and appears to be a scholarly reference. I noticed that some of the facts in the Fontani-Costa-Orna book conflicted with facts I obtained from my own investigation. I began to check references that the authors had cited. Rather quickly, I began to suspect that Fontani, Costa and Orna had not performed their own research, analysis or writing for that section of their book. 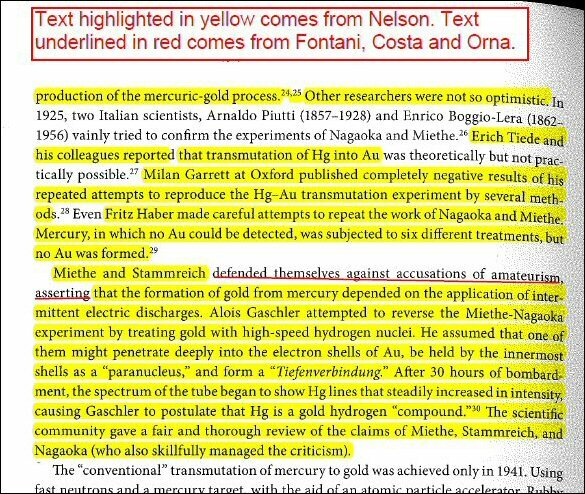 The structure of the Fontani-Costa-Orna "Modern Alchemy" section not only mirrors the scope of coverage in Nelson's research but also duplicates, without attribution, many complete sentences and paragraphs, some with tiny changes and others verbatim duplications without attribution. The authors knew of Nelson's research. In their "Modern Alchemy" section, they provide more than 100 references to sources. Yet despite directly copying a great deal of Nelson's text without attribution, they cite Nelson's 1998 research as one of their sources. They also list his Web site in their bibliography, and they say nothing more about Nelson. Within a few pages, the pattern became clear to me. 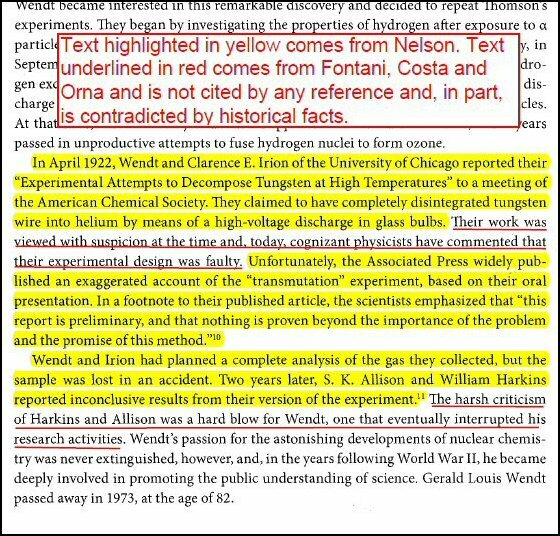 When Fontani, Costa and Orna discussed specific technical details of the 1910s and 1920s research, they copied text directly from Nelson without giving him any credit. I did a few spot checks farther into the "Modern Alchemy" section. 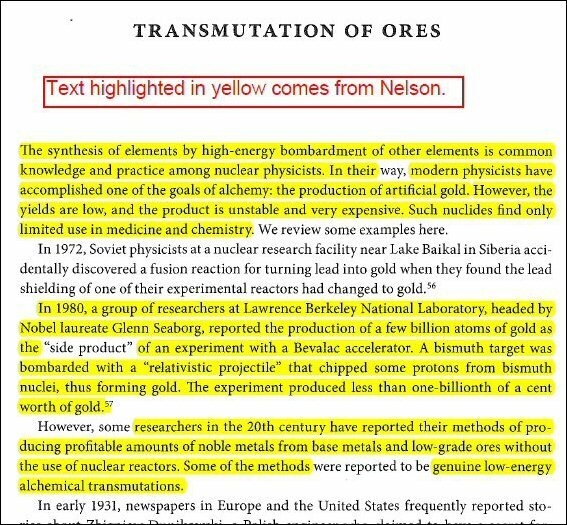 Not only did I find that the plagiarism in this section recurred, but I also found that the authors made strategic omissions and changes in the descriptions they appropriated from Nelson in order to bolster their thesis that all of these reported transmutations were invalid. 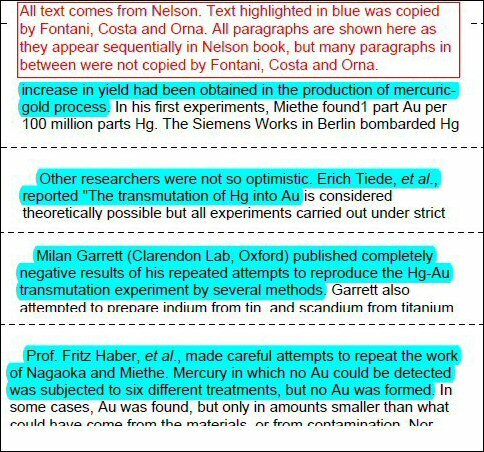 In some cases, Fontani, Costa and Orna made statements that appear to be incorrect, though they are not fully to blame; some of these errors were in the original Nelson text. The Fontani-Costa-Orna book was produced with the financial support of Ente Cassa di Risparmio di Firenze. In the acknowledgments, the authors cite assistance from people at the University of Siena, the University of Florence, the University of Illinois, Oregon State University, the Italian Chemical Society, the Committee of the International Congress of History of Chemistry, the Italian Society for the Advancement of Science, the Tokyo Institute of Technology, the Japan Isotopes Data Institute, the Chemical Heritage Foundation, the American Chemical Society, and the Institute for Chemicals and Fuels from Alternative Sources (Canada), among others. The authors even acknowledged people who assisted with the book but who have since died. The authors give a special thanks to Peter van der Krogt, "who published the specialized Web page dedicated to the chemical elements and their history." Yet among the more than 100 named individuals, the authors did not acknowledge Robert Nelson, nor did Fontani, Costa and Orna identify any assistants who did research and writing on their behalf. I do not know whether all three authors were involved in the plagiarism. I have not examined other sections of the book for similar problems. Nelson, on the other hand, was meticulous in citing his sources. He was professionally trained as a paralegal who specialized in contracts, and his expertise is evident in his citations of sources. His precise bibliography made it very easy for me to conduct my own research. Fontani, Costa and Orna wrote in the acknowledgments that an Italian version of their book was published in 2009 by the Italian Chemical Society. That 544-page book is De Reditu Eorum: Sulle Tracce Degli Elementi Scomparsi, [On Their Return: On the Trail of the Missing Elements], by Marco Fontani and Mariagrazia Costa. Nelson appears to have produced his photocopied version of Adept Alchemy in 1998. Not only do Fontani, Costa and Orna cite Nelson's work but his work is also cited by Mark Morrisson in Modern Alchemy, published by Oxford University Press. Nelson's work is cited, but not dated, in Joseph Farrell's self-published 2009 book Philosopher's Stone. 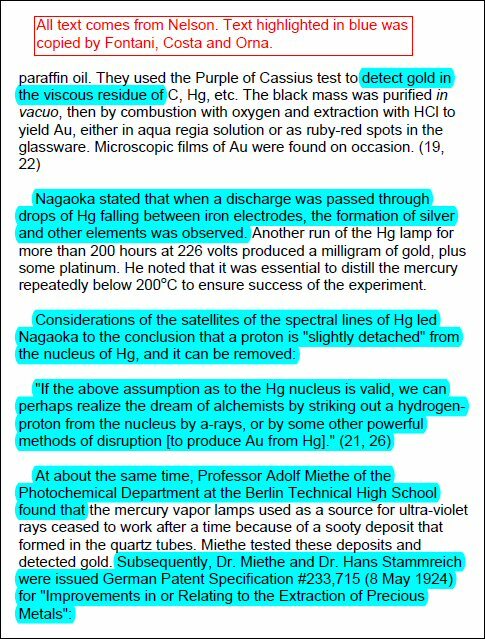 In 1998, Nexus magazine published one of Nelson's chapters, "The Transmutation of Mercury Into Gold," in its Oct.-Nov. issue. Nelson registered the domain name for his Web site in 2000, and at some point, perhaps in 2005 (but certainly no later than May 2006), he published an Internet version of his research at the address http://rexresearch.com/adept/aacont.htm. 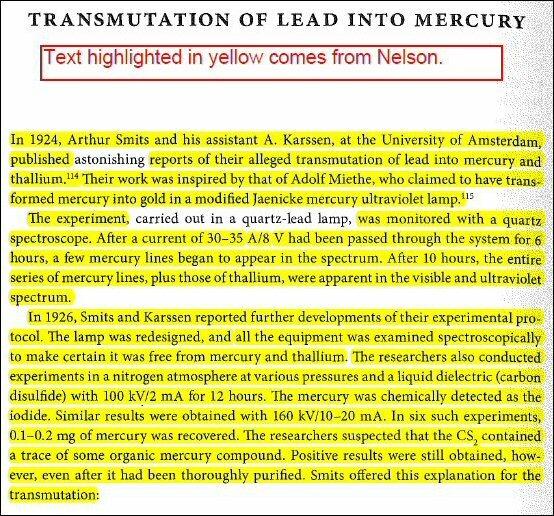 According to the Internet Archive (http://tinyurl.com/oyznkz9), Nelson's research was online by May 10, 2006. Nelson has graciously given me permission to upload a copy (PDF) of his research to the New Energy Times Web site. I began my review of the Fontani-Costa-Orna book on Page 451 and examined the next three pages in detail. Once I saw the pattern of blatant plagiarism, I made only spot checks on Pages 461, 468 and 476. Each of those three pages showed the same pattern of plagiarism, and I did not see the need to check any other pages. Fontani, Costa and Orna also made several insidious changes that distort and misrepresent this history. The first one I noticed was on Page 451 of their book. They discuss the work of chemists Gerald Wendt and Clarence Irion at the University of Chicago. 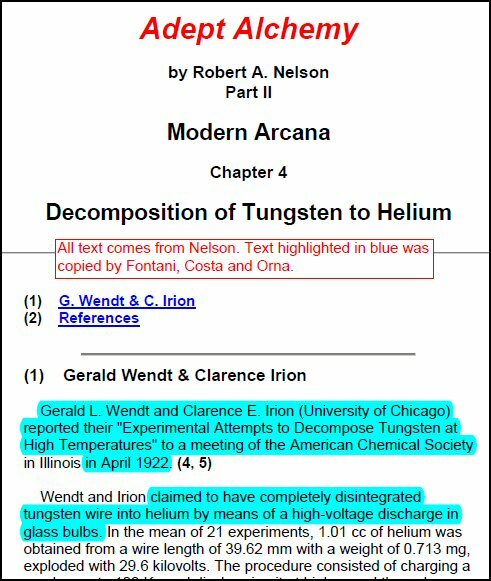 Fontani, Costa and Orna wrote two sentences about Wendt and Irion without citing sources: 1) "Their work was viewed with suspicion at the time and, today, cognizant physicists have commented that their experimental design was faulty" and 2) "The harsh criticism of Harkins and Allison was a hard blow for Wendt, one that eventually interrupted his research activities." Although Fontani, Costa and Orna borrowed ample text from Nelson on this page, they omitted Nelson's quote of Wendt which gives the actual reason for his and Irion's termination of the work: "The work was stopped by the failure of the health of the senior author." Nelson, in turn, had quoted (and cited) Wendt from a primary source. 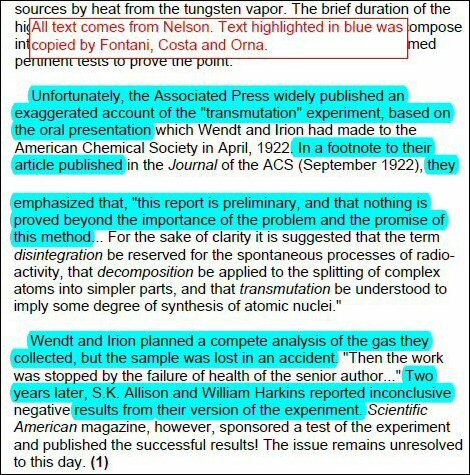 The Wendt/Irion paper published in the Journal of the American Chemical Society, and Footnote 8, Page 1893 reads: "The work was stopped by the failure of the health of the senior author, necessitating a complete rest for a year or more." On Sept. 9, 2015, before I had any idea about the plagiarism, I sent an e-mail to Fontani and asked him for his sources on the uncited statements above. Fontani replied the following day with a secondary source that was published 73 years after the fact: "We consulted the original papers of the persons you mention in your email, and we also consulted several secondary sources, listed below: Le bugie della Scienza. Perché e come gli scienziati imbrogliano by Federico Di Trocchio (1995), Genio incompreso by Federico Di Trocchio (1996)"
That's when I began to examine the Fontani-Costa-Orna text more closely and found the duplications. 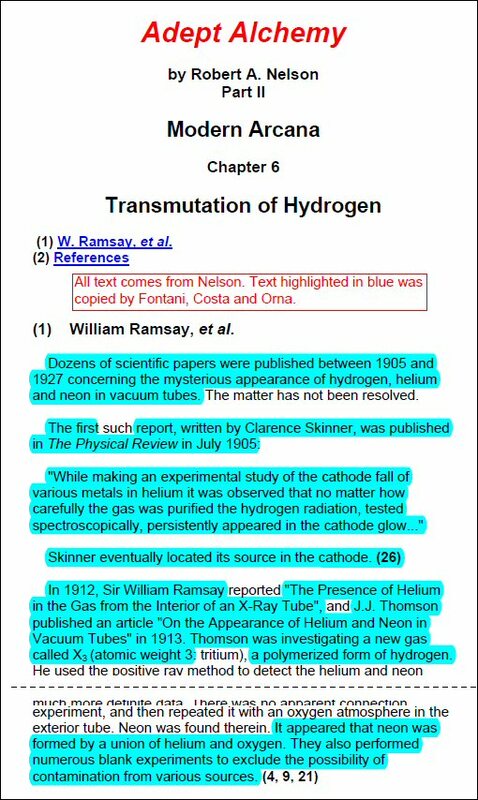 On Fontani, Costa and Orna's Page 468, I found another insidious change on the topic of unexplained production of neon and helium in vacuum tubes. 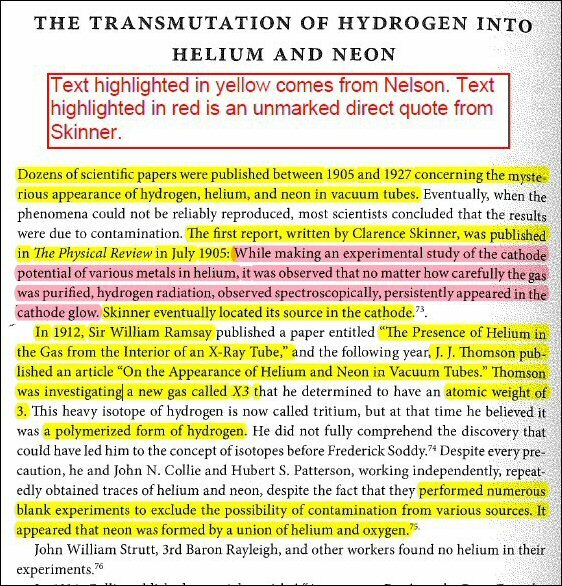 Here is Nelson's original text: "... neon in vacuum tubes. The matter has not been resolved. The first such report ... "
Here is the changed Fontani, Costa and Orna text: "... neon in vacuum tubes. Eventually, when the phenomena could not be reliably reproduced, most scientists concluded that the results were due to contamination. The first report ... "
I published this report on New Energy Times on Dec. 20, 2016. At that time, I notified Fontani, Costa, Orna, Nelson, the Oxford University Press office in the U.K. Lewis, the OUP editor in the U.S., and Nobel Prize winner Roald Hoffman, who wrote the preface to Lost Elements. 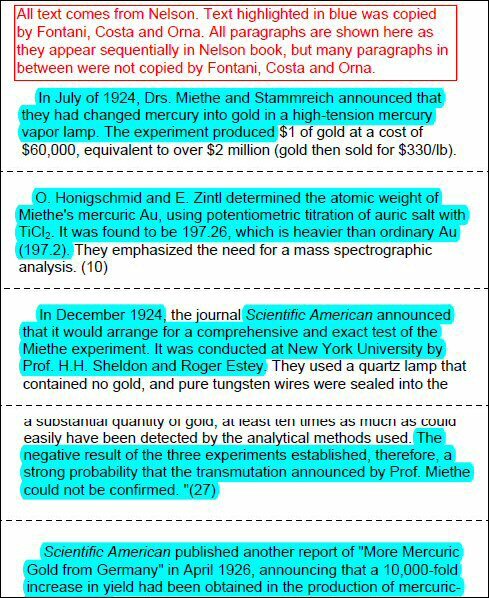 Not only was text copied, but the structure was largely copied, as well. 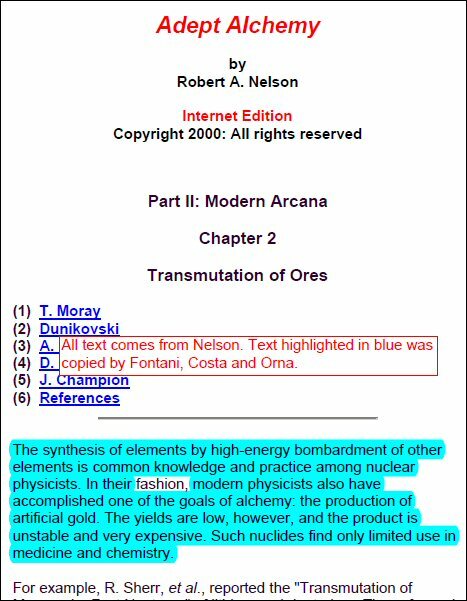 The "Modern Alchemy" section in the Fontani-Costa-Orna book mirrors all the topics in the section Part II of Nelson's Adept Alchemy Web pages except Nelson's chapter on carbon. VII.10. Some like It "Cold"
VII.11. Is Cold Fusion Hot Again?